Most of us make do with text based emails but the email protocol allows for embedding HTML content as well. You can basically create a simple webpage – complete with images, links, stylesheets and social buttons – and send it as an email. But like with most browsers and the subtle differences in their rendering of a webpage, different email clients also have their own take on interpreting HTML emails. This makes for a testing nightmare since unlike browsers, where designers have to target only four (Internet Explorer, Google Chrome, Mozilla Firefox and Apple Safari), email clients are much more varied and sending mails to different accounts quickly becomes untenable. 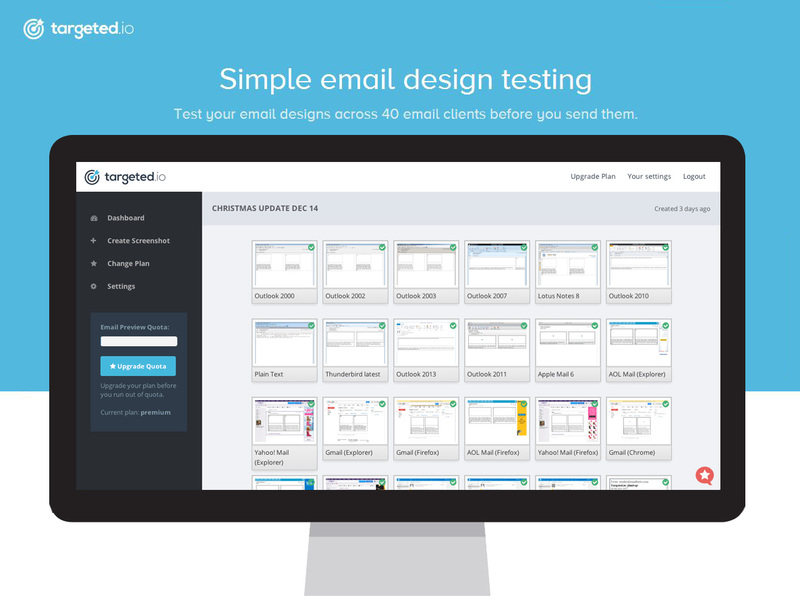 Targeted.io makes email design testing simple by providing a simple screenshot based previews of the design across multiple clients and platforms. Both founders, Jonathan Bird and Mark Dowton, were regularly assigned the task of creating HTML emails in their previous job as web developers. Recalls John, “We use to dread this as it took us twice the time to fix bugs in Outlook as it did to code the actual email!” They realized they weren’t alone in their frustrations when the initial launch of the service got over 200 early signups. Targeted.io is a simple online dashboard that wants to help businesses create email designs that look consistent across all platforms by providing screenshot previews on 40 desktop and mobile email clients. The closest competitor of Targeted.io is Litmus but it’s services cost way more. Targeted.io prices its plans from $25 for basic features and select email clients compatibility to $75 with advanced features like spam testing (so that your rich email doesn’t gets blacklisted by the email client) and compatibility with all 40 clients. Next articleBerufy Helps Match The Right Employee To The Right Employer!